A special report has collected data on journalists in jail , discovering that Turkey’s arrests have increased the worldwide number of journalists arrested to 259, the highest number recorded since 1990. The Committee to Protect Journalist (CPJ) has published the analysis on its website, showing that most arrests are due to anti-state charges. The previous global record for journalists in prison during a year was 232, but 2016 numbers up to December 1 surpassed that figure with 259 arrested journalists. In 2015 there were 199 journalists imprisoned for doing their job. The analysis only includes journalists in government custody and not those who have disappeared or held captive by non-state groups, otherwise, the number would be much higher. Image Credit: Mustafa Ozer / AFP / Getty Images. CPJ considers journalists as people who cover or comment events happening in a region, including public affairs, through the media. Journalists use the internet, newspapers, photographs, radio and television to report what they have seen or noticed. Turkey’s recent situation has triggered a series of arrest and the shuttering of more than 100 news outlets. The current administration suffered an attempt of a coup the état that has provoked the arrest of 81 journalists for reporting the news. The failed coup happened in July, and after it, the press and people that make it are at risk to be imprisoned for not producing news the government approves. 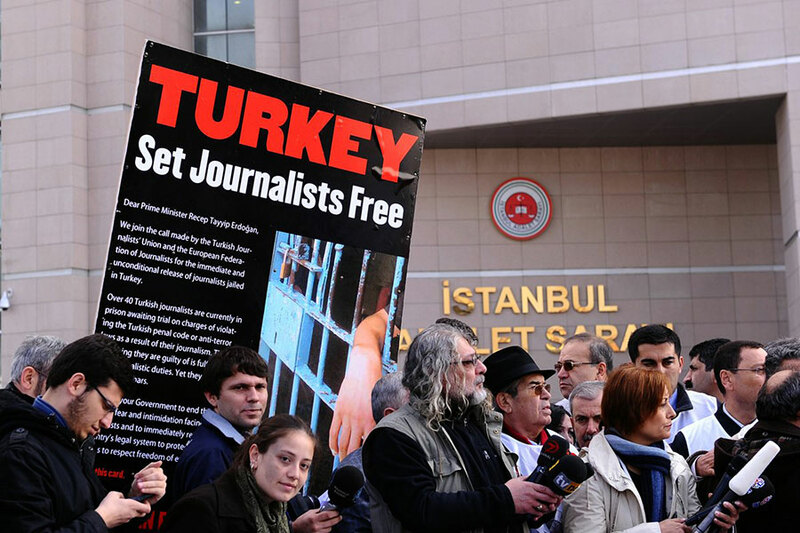 Turkey’s arrests account nearly a third of the global total of journalists in jail around the world. Apart from the known 81 journalists, the CPJ believes there are others in prison for practicing the same activity but could not link their cases to journalistic work that could be accused of an anti-state crime. The CPJ reports that media freedom was already under attack in early 2016. Authorities arrested, harassed and expelled journalists and even shut down or took over news outlets. After the failed coup on July 15, 2016, President Recep Tayyip Erdoğan and his administration were harder on the press under an emergency state, which granted Tayyip Erdoğan government additional powers. Those new faculties were used to arrest more than 100 journalists and closed down around 100 news agencies. The government blames a terrorist organization led by Fethullah Gülen – U.S. based Muslim cleric – for the failed military coup that tried to oust Tayyip Erdoğan. Since then, many journalists have been charged with collaborating with the group. Journalists in Turkey are accused of insulting the president, being part of a terrorist organization, obtaining secret documents, and producing propaganda for the Kurdistan Workers’ Party (PKK) and also the Fethullah Gülen Organization (FETÖ) – the government’s two rivals. Kurdish journalists are the most vulnerable to be arrested in Turkey because the government accuses them of supporting the coup. Zehra Doğan, a Kurdish journalist, was put in jail for taking photos and talking with people on the street, according to the testimony of some witnesses. The wife from one of the journalists imprisoned in Turkey told CPJ that her husband had been mistreated after being arrested and translated to court to defend his innocence. She reported the journalist has been kept hungry deliberately and verbally abused. He has also been held in filthy conditions. After the coup, not only journalist were persecuted by the government. Over 125 thousand people were arrested including public workers, soldiers, teachers and police officers. China, Egypt, Eritrea, and Ethiopia have violated the rights of the free press in 2016 and previous years, contributing to the global 259 journalist arrests during this year. China has jailed the most journalists worldwide in the previous two years while in Eritrea, journalists have frequently disappeared without any legal process into the secretive country’s detention system, says CPJ. Ethiopia repression to the press has deepened in the recent months, and Egypt’s number of arrested journalists rose from 2015. Iran’s number of journalists in prison decreased, making 2016 the first time that Iran does not make it to the top five worst oppressive countries in the world. Still, Tehran continues to send journalists to jail, punishing them with prison and lashes, as it happened to filmmaker Keyvan Karimi. The CPJ report includes new countries that were not included in the 2015 edition. Those countries are Cuba, Nigeria, Panama, Kazakhstan, Singapore, Tunisia, Venezuela, and Zambia. Most charges alleged to journalists around the world are related to anti-state activities in an attempt to silence people working with the press that reports sensitive issues including insurgencies, ethnic minorities, and political opposition. The majority of journalists in jail were freelancer before 2011. In recent years they are staff members. Foreign journalists are being held in Ethiopia, Panama, Singapore and Russia while Venezuela and Eritrea have arrested dual citizens for journalistic activities. Regarding journalists who have disappeared or being held by non-state groups, CPJ estimates that at least 40 of them are missing or kidnapped in the Middle East and North Africa.